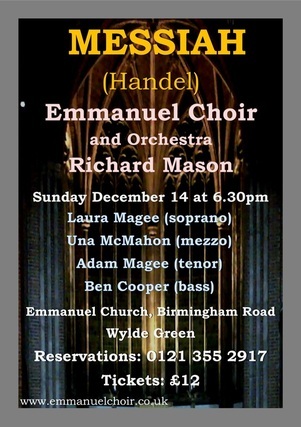 Composed in 1741, Messiah was Handel's sixth foray into oratorio and is today his best-known by far, particularly the famous "Hallelujah" chorus. Following the immensely successful summer tour to France and a triumphant performance last December, Emmanuel Choirs and invited orchestra perform the work once more in 2014. To book, contact us or call 0121 355 2917.